The map above shows all countries whose capital was not their largest city, based on population, in 2010. This explains why South Sudan does not appear as a separate country, however if it did it would not be among the countries included (Juba is both the capital and largest city of South Sudan). 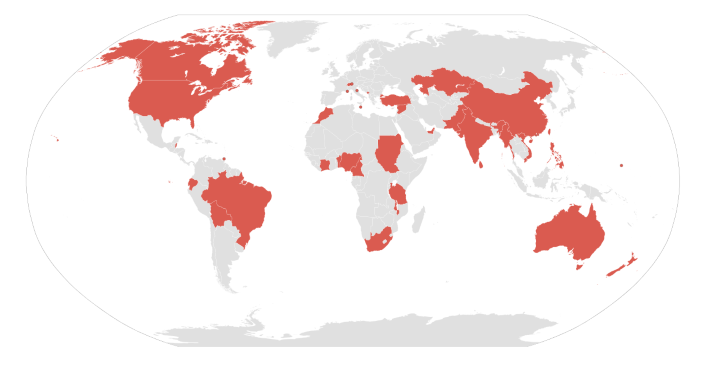 36 countries have a capital that is not their biggest city. Beijing at 22 million people is the largest city to appear on the list since Shanghai has roughly 1.2 million more inhabitants. Ngerulmud (capital of Palau) at 271 people, is both the smallest capital city on the list and the one with largest ratio between it and the largest city, Koror which has 11,200 people, making the latter 41 times larger. Almost all European countries, with the exceptions of Liechtenstein, Malta, Monaco, San Marino, Switzerland, and Turkey have capital cities that are also their largest cities. While London is by far the largest city in the UK, the former British Dominions of Canada, Australia, New Zealand, South Africa, Sri Lanka, India and Pakistan all have other cities that are bigger than their respective capitals. You can find out the full list of countries here. it mean your wikipedia need improvement well. I’m not an expert and not pretending to be – at all – so please don’t anyone be offended but is the issue here that ‘Manila’ is now actually two things? That is, isn’t there a ‘Manila metropolitan area’ that includes Manila, Quezon and Caloocan (among others) and so is of curse bigger than Quezon itself (in fact it has 10m people or so), but also the city of Manila itself which is the capital but actually smaller than Quezon? Actually 6 of the 7 most populous countries on earth have a capital that is not their biggest city. I think Philippines should’nt be included on this map because from Filipino perspective Quezon City “Kyusi” is also Manila “Maynila” like all other cities in Metro Manila which is the de facto capital of this country. You must not always rely on Wikipedia pls try other resources.